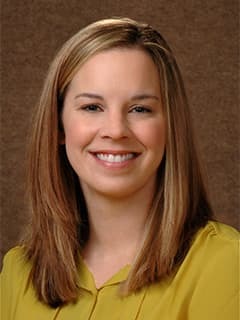 Rebecca F. Burnett, PT, DPT, PCS, is a physical therapist with the CHOP Career Path Program and the Sports Medicine and Performance Center at Children's Hospital of Philadelphia. I began working at Children’s Hospital of Philadelphia (CHOP) in 2011, and joined the Sports Medicine and Performance Center at our Main Campus in 2012. During my time at CHOP I have also worked in the acute care setting, treating a variety of orthopaedic injuries in the immediate post-operative phase. Prior to working at Children’s Hospital of Philadelphia, I worked as both a developmental and Sports Medicine pediatric physical therapist in Miami, Florida. I am also a Pediatric Certified Specialist. My special interests include overall injury prevention of the adolescent athlete, ACL injury prevention and treatment, as well as the throwing athlete.